Whitworth choirs to present 2010 Christmas Festival Concert, "Heaven and Nature Sing"
The 2010 Whitworth University Christmas Festival Concert, "Heaven and Nature Sing," will take place in Bellevue, Seattle and Spokane, featuring the Whitworth Choir, the Whitworth Women's Choir, and the Whitworth Men's Chorus. More than 120 students will serve as singers, instrumentalists, and narrators. For more information, please call (509) 777-3280. The concert theme, "Heaven and Nature Sing," will be illustrated through choral works, spoken word, and carols for audience and choirs. 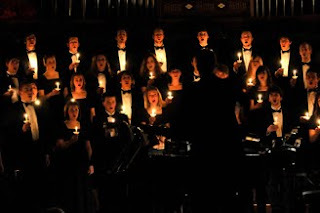 Presented without interruption, the ever-popular concert will be concluded in candlelight. Musical selections will include Marc A. Hafso's "Lord, You Have Searched Me Out," Wilbur Chenoweth's sweeping setting of "Of the Father’s Love Begotten" for mixed chorus and organ, baroque composer Niccola Porpora's "Magnificat" for women's voices and string ensemble, David Meece's "One Small Child" for men's voices, Eric Whitacre's moving setting of "Lux Aurumque," English composer Richard Rodney Bennett's "Susanni" and "Sweet Was the Song," and Vaclav Nelhybel's joyful "Estampie Natalis." The Whitworth Choir will perform under the direction of Marc A. Hafso, professor of music and director of choral activities. Deborah Hansen, associate director of choral activities and chair of the music department, will direct the Whitworth Women's Choir. Scott Miller, assistant professor of music, will direct the Whitworth Men's Chorus. Mac Merchant and Mary Trotter will serve as accompanists, along with organist John Bodinger. Saturday, Dec. 4, at 7 p.m.
Sunday, Dec. 5, at 3 p.m.
Friday, Dec. 10, at 8 p.m., and Saturday, Dec. 11, at 3 p.m. and 7 p.m.
First Presbyterian Church of Spokane, 318 S. Cedar St.